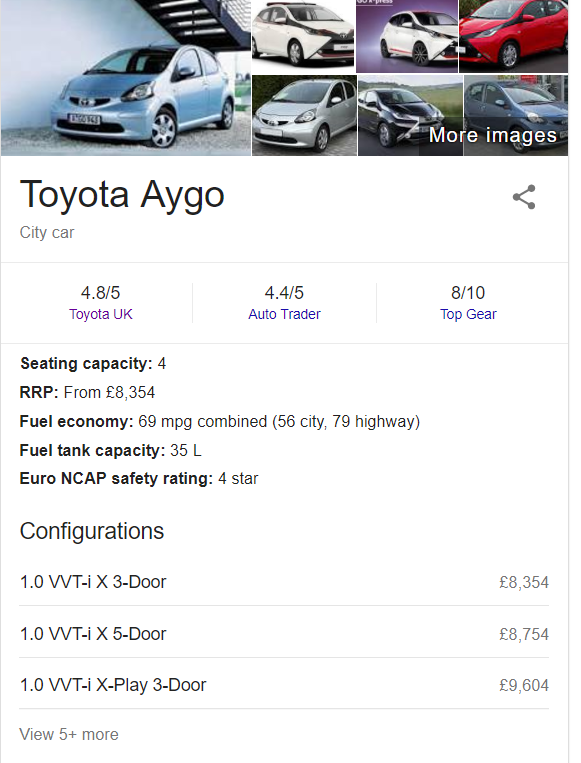 Toyota Motor Europe (TME), led in the area of Semantic SEO by MakoLab SA and Hepp Research GmbH, has implemented elements of schema.org core and auto.schema.org extension vocabularies in their websites across Europe. In particular, TME’s Models and Specification Pages (e.g. Spec1 , Spec2) and Grades Details Pages (e.g. Grade1, Grade2) contain schema.org markup with types and properties from both core of schema.org and the automotive extension. In some other pages (like the main car pages (e.g. Main1, Main2) there is schema.org markup targeting the display of Google Rich Snippets (price/reviews). 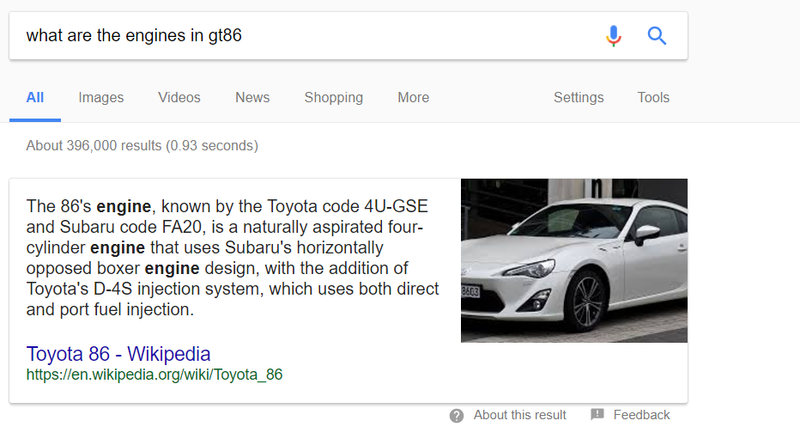 "name": "1.0 VVT-i (69 hk)"
While the use of auto.schema.org seems to be quite modest in its scope, the size of the set of URLs that contain elements of the markup is impressive: our post-implementation assessment shows that objects of type Car are in almost 7000 URLs from the entire TME web landscape – already indexed by Google! What are the effects of the markup? 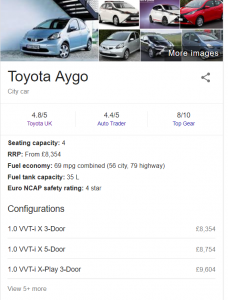 It is expected and highly anticipated, that the manufacturer’s websites with Schema.org markup will be very trustworthy source of information for Google, and the data in the Knowledge Panel will be coming from this source. Today we can see that the data comes from various websites’ content (for example from Wikipedia, manufacturer’s websites and other), but we suspect they might be soon based to a higher extent on the most reliable data which is the structured markup embedded into the pages of the manufacturer website. 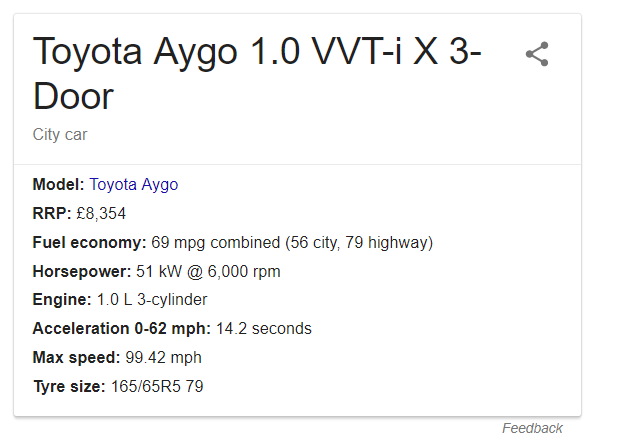 Despite using a small part of the schema.org and automotive extension vocabularies in the TME websites the early results are quite promising and show the impact of the schema.org markup on the Customer Search Experience related to the manufacturer. 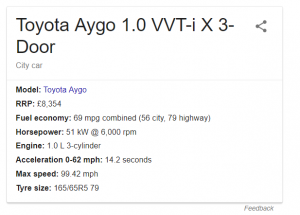 Hi I am trying to search the toyota aygo example but I couldn´t. What words I should use to see this example? ?